Joseph Vissarionovich Stalin (18 December 1879 – 5 Mairch 1953) wis a Soviet politeecian an heid o state who servit as the first General Secretar o the Communist Pairty o the Soviet Union's Central Committee frae 1922 till his daith in 1953. Efter the daith o Vladimir Lenin in 1924, Stalin rase tae acome the leader o the Soviet Union, which he ruled as a dictator. Stalin launcht a command economy, replacin the New Economic Policy o the 1920s wi Five-Year Plans an launchin a period o rapid industrialization an economic collectivization. The upheaval in the agricultural sector disruptit fuid production, resultin in widespread faimin, includin the catastrophic Soviet faimin o 1932–1933 (kent in Ukraine as the Holodomor). 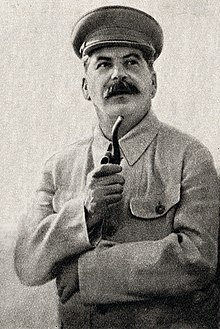 Durin the late 1930s, Stalin launcht the Great Purge (an aa kent as the "Great Terror"), a campaign tae purge the Communist Pairty o fowk accuised o sabotage, terrorism, or treachery; he extendit it tae the military an ither sectors o Soviet society. In practice, the purges wur indiscriminate. Targets wur aften executit, impreesoned in Gulag labor camps or exiled. In the years which follaed, millions o members o ethnic minorities wur deportit an aw. In 1939 Stalin entered intae a non-aggression pact wi Nazi Germany, follaed bi the Soviet invasion o Poland, Finland, the Baltics, Bessarabie an northren Bukovinae. Efter Germany violatit the pact in 1941, the Soviet Union jynt the Allies tae play an important role in the Axis defeat, at the cost o the lairgest daith toll for ony kintra in the war (maistly due tae the mass daiths o civilians in territories occupeed bi Germany). Efter the war, Stalin instawed subservient communist govrenments in maist kintras in Eastren Europe, formin the Eastren bloc, ahint wha wis referred tae as an "Airn Curtain" o Soviet rule durin the Cauld War. Stalin fostered a cult o personality aroond hissel, but efter his daith, his successor, Nikita Khrushchev, denoonced his legacy an drove the process o de-Stalinization o the Soviet Union. ↑ Findings of the Commission on the Ukraine Famine, Famine Genocide, 19 April 1988; Statement by Pope John Paul II on the 70th anniversary of the Famine, Skrobach; Expressing the sense of the House of Representatives regarding the man-made famine that occurred in Ukraine in 1932–1933, US House of Representatives, 21 October 2003; Bilinsky, Yaroslav [http://www.faminegenocide.com/resources/bilinsky.html doi=10.1080/14623529908413948 Was the Ukrainian Famine of 1932–1933 Genocide?, Journal of Genocide Research, 1999, Vol. 1.1, Issue 2, pp. 147–156. ↑ "Cult of Personality". Answers .com. Wikimedia Commons haes media relatit tae Joseph Stalin. This page wis last eeditit on 28 November 2018, at 08:59.